The way that climate change has been approached in President Trump’s administration might suggest that views on both climate change and environmental issues more broadly have always been staunchly divided along party lines. Democrats supporting regulations and greenhouse gas mitigation on one side, Republicans supporting market approaches and questioning the legitimacy of climate change on the other. But despite Trump’s words and actions, this partisan split is an oversimplification. Historically, environmentalism has not been such a polarized issue. In his 1970 state of the union address, President Nixon said: “Shall we make peace with nature and begin to make reparations for the damage we have done to our land, to our air, and to our water? It has become a common cause of all people of this country, clean air, open spaces. These should once again be the birthright of every American.” The Environmental Protection Agency and National Oceanic and Atmospheric Association were both established under Nixon’s presidency. 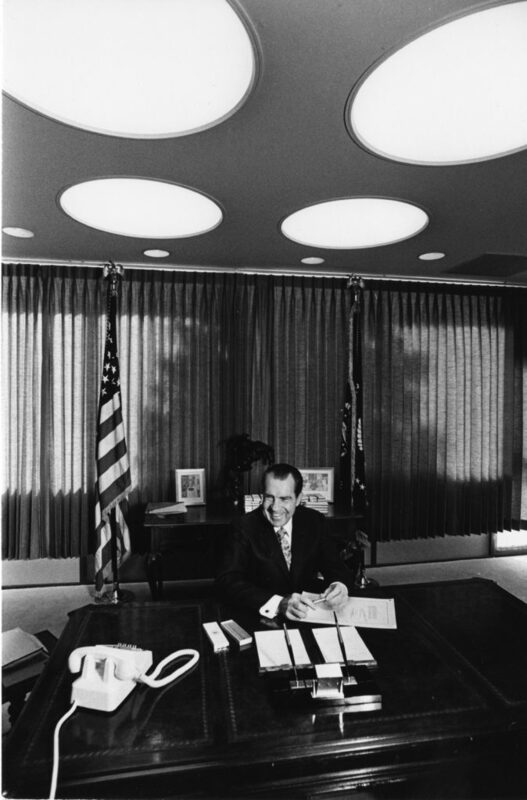 It’s been argued that Nixon’s support for environmental initiatives was a political strategy, not an expression of his sincere concern for the environment; regardless, these American environmental milestones all occurred under his administration. We can also see this bipartisan approach to environmental challenges in Congress. The Clean Air Act of 1970 had a Senate vote of 73-0. Trends in the League of Conservation Voters’ environmental voting scores also illustrate a less partisan past. (The League of Conservation Voters determines scores by dividing the number of pro-environmental votes by the total number of all potential votes on environmental legislation. Read more about their methodology here.) On a scale of 1-100, Senate and House Republicans’ scores hovered around the late 20s – early 30s in 1970, compared to scores between 50 and 60 for Senate and House Democrats. By 2012, the party scores had diverged drastically: Congressional Republicans between 0 and 20, and Congressional Democrats between 85 and 95. Though Democrats’ scores have always been higher, the parties started to pull farther apart in the early 1990s. The shift from 1970 to now has been attributed to a number of different factors: the rise of the global environmental movement, deregulation and smaller federal government under President Reagan, and even income inequality. Whatever the reason, we see the split manifest in views of American voters today. 29% of Republican voters are worried about global warming in 2017, compared to 41% in 2008. 88% of Democrats are worried about global warming in 2017, up 11 percentage points since 2008. Fewer Republican voters believe that global warming is even happening today than in 2008. Still, even this sharp divide can be questioned. When asked about taking action on global warming rather than views on global warming, the divide is not so stark. The difference here is seen more in which people and institutions Republicans believe are responsible for addressing global warming. 56% of registered Republicans want corporations and industry to do more on climate change, and nearly half think citizens should do more. Only 24% think it should be a priority for Congress or the president. But if we break that down further, some specific policy initiatives have much broader backing. Almost half of Republican voters support regulating CO2 emissions from coal-fired power plants and 57% support regulating CO2 as a pollutant. Nearly three-quarters are in favor of funding renewable energy research and tax rebates for electric vehicles. It’s undeniable that there is a party-lines split on environmental issues, and across the board, YPCCC has found higher levels of Democrat support for climate change policy. But the blanket assumption that Republicans don’t care about environmentalism is misguided. Specific, targeted initiatives and policies garner more support than general statements about global warming. Despite years of partisan environmental messaging, registered voters, both Republicans and Democrats, share common ground in supporting some proposed pollution and emissions reductions strategies.